Is your cat smarter than a fifth grader? In my last column I wrote about a few indoor activities to entertain your dog when it’s too hot to spend time outside. Cat parents face this challenge year-round. Bored cats can become stressed and destructive. What can you do to stimulate your cat, mentally and physically? Enrichment activities allow cats to engage in instinctive behaviors such as hunting and foraging — without shredding your favorite chair. If your cat grooms herself too much, paces or meows non-stop, she may be bored. These repetitive actions can be signs that your cat is psychologically stressed due to lack of variety in their habitat and daily activities. Increased biting is another sign that your cat’s bored. When cats don’t get a chance to engage in natural behaviors, such as biting, during play time, they may target their people. You may want to introduce a few of these enrichment activities into your daily interactions with your cat. Teach Fluffy to sit. Contrary to the expression “it’s like herding cats,” you really can train your cat to perform a few basic tricks. You can use clicker training to teach your cat to sit and “high five.” Using a small clicker device (sold in pet stores), you pair the clicking sound with a reinforcer (treat) to mark and increase desired behaviors. You can wait until your cat sits naturally, and then reward the behavior with a click followed by a treat. Or you can use a treat to lure your cat into sitting, and then click and treat when she does. To lure her, hold a treat close to your cat’s head and then move it in a straight line from her nose over her head between her ears. When you do this, she’ll shift her weight into a seated position. Say “sit” and click as she engages in this behavior. Be sure to give her the treat after you click. Use a puzzle feeder. Cats, like dogs, can work for their treats and food by using a treat-dispensing puzzle toy. The beginner versions are simply balls that dole out treats when they’re swatted. The advanced versions require feline problem solving. Is your cat smarter than a fifth grader? This is a good way to find out. If your cat doesn’t “get it” right away, you may have to show him the connection between pawing the toy and getting the treat. To see whether your cat may enjoy a puzzle toy before you invest in one, try a homemade version. Cut small holes in an empty toilet paper or paper towel roll, fill it with food, then fold the ends over. You can make the task easier by cutting more, bigger holes. As your cat figures out the game and needs a bigger challenge, cut fewer, smaller holes. Take Kitty for a walk. Leash walking isn’t just for dogs. Leave the harness or leash out in your cat’s favorite hang-out area so he can get used to its sight and smell before you put it on him. 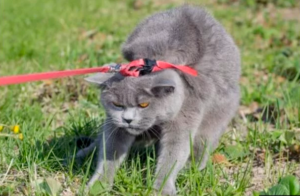 Then put the harness or leash on your cat and give him a treat. If your cat won’t budge, use a chopstick dipped in cat food gravy to lure him into walking. Hold the chopstick a little way in front of your cat and allow him to lick the food when he reaches it. Gradually move the chopstick further away so your cat has to walk farther to get the treat. Provide scent-sations. In the wild, cats encounter a variety of unfamiliar scents in their home territory. Providing novel odors for your cat to explore in his home environment is important for his well-being. According to research on feline scent preferences, the particular smell itself is less important to cats than the availability of a variety of odors. In other words, it doesn’t matter what scents you introduce, as long as you rotate them. To provide fragrant enrichment opportunities, you could exchange cat toys with a neighbor or wipe a washcloth on a friend’s dog or bunny. Catnip-filled toys bring out extra playfulness in some cats. Bring the outdoors in. According to Kristyn Vitale, a cat researcher at Oregon State University, safe access to the outdoors is crucial for your cat’s well-being. Because the outside world is often dangerous for city and suburban cats, you have to find a contained way to allow your cat to enjoy outdoor sights and smells. A screened window perch or outdoor screened “catio” (read: screened porch for your kitty) give your cat a delightful taste of the “wild” without the risk of being hit by a car or eaten by a predator. My online search for “outdoor cat enclosure kits” yielded 1.9 million results — seriously. If you’re groaning while you read this, thinking “I can’t believe I’m supposed to work this hard to keep my cat happy,” it could be worse. You could have a young, high-energy dog bouncing off the walls and ceiling because he can’t go outside and play. A cat toy or two is a relatively small price to pay for a contented kitty.